Liverpool will play Bournemouth in the quarter final of Capital One Cup tonight at Goldsands Stadium. 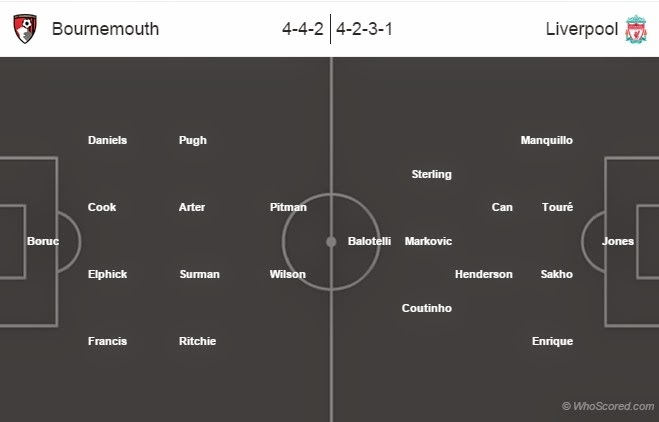 Bournemouth manager Eddie Howe has no injury concerns which means the strongest eleven will be named against the Premier League side Liverpool. Striker Callum Wilson is likely to start his first game for the Bournemouth in the Capital One Cup. Meanwhile, Liverpool boss is eyeing to take the cup seriously. He will be going with his strongest side. Mario Balotelli is expected to return to line-up after his injury. The Italian was introduced in the second half against Manchester United last weekend. Goalkeeper Brad Jones is likely to remain in the goal. But Glen Johnson will miss with a groin injury. Striker Daniel Sturridge, right-back Jon Flanagan, midfielder Suso all remain out with their respective injuries. Bournemouth are yet to beat Liverpool in any competition. It will be the first appearance by the home side in the Capital One Cup quarter final. Liverpool are unbeaten their last 10 League Cup games. The away side have won six games from their last seven League Cups ties. Bournemouth 1 – 3 Liverpool. balo wont play as per daily mail latest news!